The very first time I visited the Smoky Mountains, I saw an old mill that had been turned into a restaurant, complete with the water wheel still turning. That evening as the afternoon clouds broke, the vibrant colors of the sunset cast a beautiful golden light all across the countryside. The next day, I took photos and made preliminary sketches on site, while taking careful notice of all the tiny details such as how the Pigeon River looked as it flowed through the town, what kinds of plants grew in the national park, how the trees looked as they grew amid the big rocks in the mountains, how the lichens and moss collected on the boulders, and what critters had made this amazing land their home. Remember When is the result of all that research, and it captures the beauty I was overcome with when I first came to the mountains years ago. This rustic old mill is not the same mill I saw during that first visit to the Smoky Mountains, this one is located in West Virginia. The setting reminds me off the beauty of nature, but the mill reminds me of the settlers who tamed this wilderness and used this mill to grind corn and flour for food. 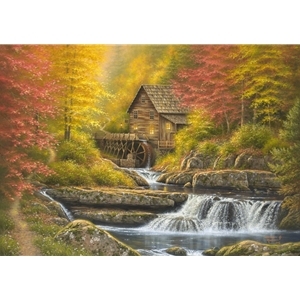 I hope this Old Mill blesses you and perhaps brings back some memories for you. As you think of those early settlers, and the hardships they endured just to get simple pleasures, try to Remember When.